I love a simple recipe. I also love to take a simple recipe, like one for macaroni and cheese, and turn it on its ear by adding and altering ingredients to create something entirely different and entirely delicious. This recipe started out as one of those creative journeys into my childhood favorites… but with an added spark of the here-and-now. I’ve always loved macaroni and cheese. It’s a secret indulgence, a hidden splurge, and a step beyond the “blue box” staple that most think of when “macaroni and cheese” is mentioned. Lots of chefs do their own rendition of this meal and I, while not a chef, have a version that I have served to hungry throngs of volleyball players more times than I can count. This recipe, howe ver, is one that is heartier than most, with the addition of ground turkey. While a variation of the original, it’s got the staying power of a great meal. Feel free to play with the ingredients to suit your own family’s tastes! Start by browning the ground turkey in a large sauce pan. You won’t need to use a stock pot or anything very deep since you’ll be transferring the meat into a casserole dish to bake later. Once browned, top liberally with mesquite steak seasoning and red wine, as you do in taco meat directions, and cook until the liquid is thoroughly absorbed. I used the same amount of steak seasoning and wine as the taco seasoning packet directs (I always have to recheck that part) and the meat becomes something entirely new and really tasty. While the meat is browning, cook your jumbo macaroni pasta to al dente and then drain. Feel free to use another pasta shape if you prefer – I love the fat rounded shape of the jumbo elbow macaroni, so we keep that in the house for just such an occasion. Once the meat and pasta are both cooked, blend them together in a large casserole dish. You’ll want to make sure to mix them thoroughly so there aren’t big clumps of either meat or pasta. Now make your cheese sauce. Start by melting your butter and flour together and allow them time to bubble a bit to cook off the flour taste. Alternately add both milk and white wine (equal amounts is fine) until the white sauce is smooth and thickened. You’ll know you’re done adding liquid if the white sauce is just barely thick but has nice flavor. I know that doesn’t sound like a very precise term, but I really do feel my way around this part of the cheese sauce. The sauce needs time to cook and incorporate the milk and wine, so take your time at this point… it can take 7 minutes or more to add/cook the sauce until it “feels right”. Once you’re happy with the white sauce, add liberal amount of cheese to morph this into your cheese sauce. I sometimes add a sprinkle of fresh nutmeg before I season with salt and pepper… just a little will go a long way to make this dish your own. Make sure to taste your cheese sauce… it’s the final touch of this casserole and needs to taste yummy before you add it to the dish. Pour cheese sauce over meat/pasta, top with cheese, and bake casserole at 350 degrees for 30-45 minutes or until top is nicely browned and cheese is crunchy. Serve hot. 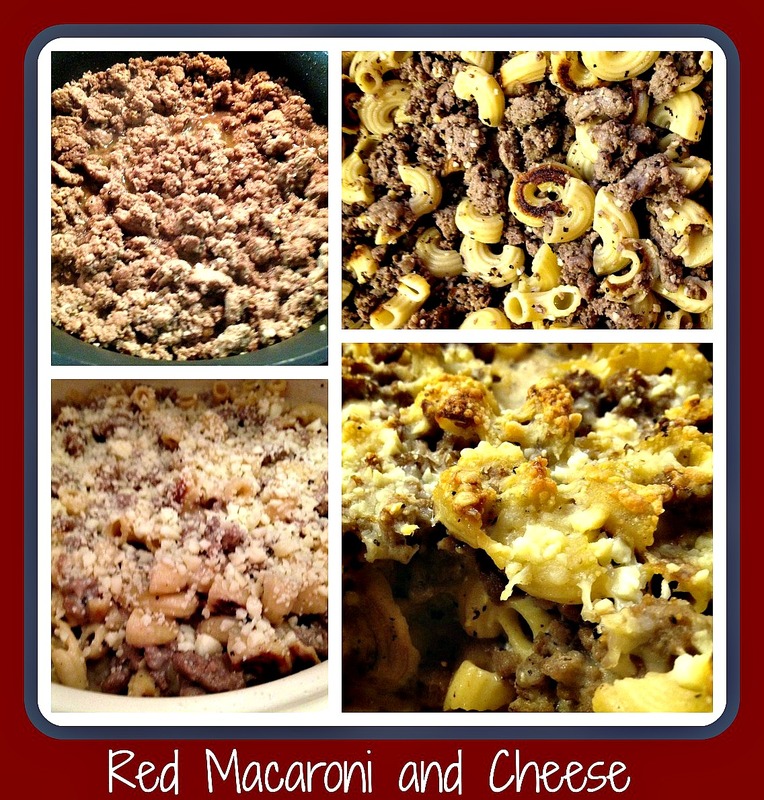 This is a great dinner to make a day ahead and simply bake that evening. Since everything has already been cooked, all you’re really doing is bringing all the ingredients together into a wonderful warm meal of comforting goodness… just the right touch after a long day and a chilly drive home. Add some warm bread and I don’t know many people who could possibly resist…. I know my family wouldn’t! This entry was posted in Cooking, Recipe, Wine and tagged cheese, comfort food, easy recipe, James River Cellars Cabernet Franc, macaroni.